I recently had the pleasure of meeting Mr. Horst Wenzel. 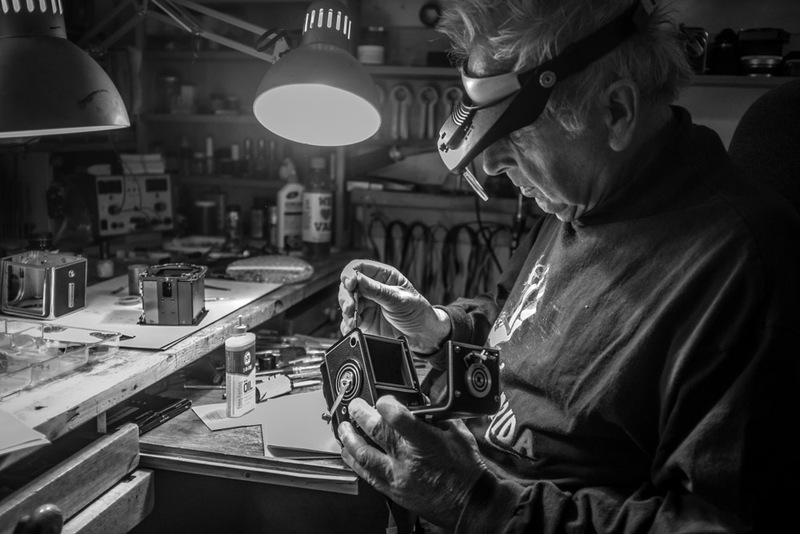 He's legendary in Vancouver for his repair and servicing of vintage and world class film cameras like Rolleiflex, Leica and Hasselblad. Kind thanks to talented local photographer and artist Ross den Otter for directing me to Horst. Officially retired, Horst accepts service and repair jobs, working out of the basement of his home in Dunbar. It was there that I met him, my Rolleiflex 2.8C in hand. "It's in pretty good shape," was his assessment after peering through my 1955 Rollei and working the mechanisms with confident hands. Horst agreed to replace the focus screen and mirror in my camera for the absurdly low fee of $50. I supplied the parts, which I had ordered online from a specialty supplier but, even so, I thought it a bargain. I say Horst agreed to do it, because I consider it a privilege to have someone with his experience and knowledge accept this work. Let's face it. Horst doesn't need the business. I think he does it to help people like me, who have these cameras from a bygone era that very few people know how to services and repair. Or perhaps he does it for the enjoyment and satisfaction of working with superbly designed and engineered photographic equipment, the likes of which is just not seen in today's products. "After an overhaul, they will go another twenty-five years," Horst told me. Another 25 years! Who makes this kind of product anymore? I love my Fuji X100T, purchased in 2015. I carry it everywhere and use it almost daily. But I know that in perhaps five years it will have been replaced my the latest thing, or sold, or collecting dust. If it breaks down there's a good chance it will never be repaired due to the extreme repair cost versus the price of a new camera. Even if my X100T could go for 25 years, it would be rendered useless long before then by the built in and well planned obsolescence of its batteries, memory card, software and connectors. 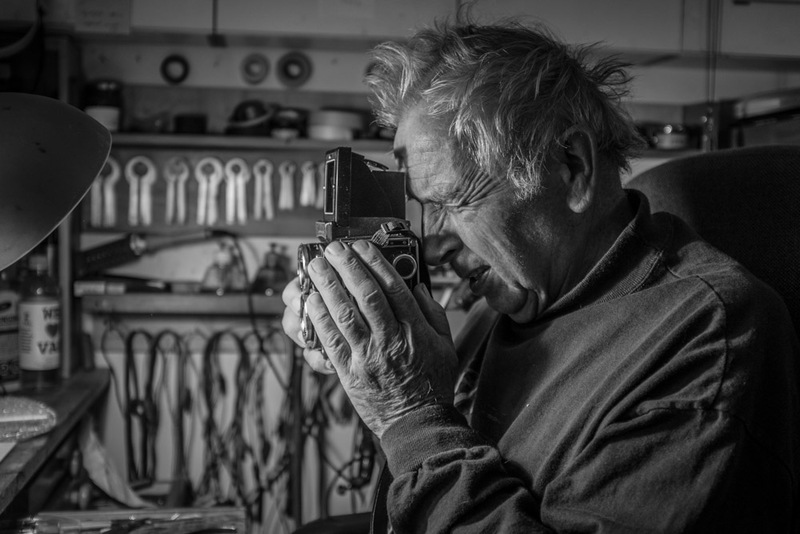 During my meeting with Horst he took time to show me some of the other fascinating camera repair and restoration projects he had underway, and of course he allowed me to make a few photographs of him in his workshop. What an honour. Horst Wenzel adds a small drop of lubricant to one of the rollers in my Rolleiflex 2.8C. Horst Wenzel checks out my Rolleiflex 2.8C. "It's in pretty good shape," is his conclusion. 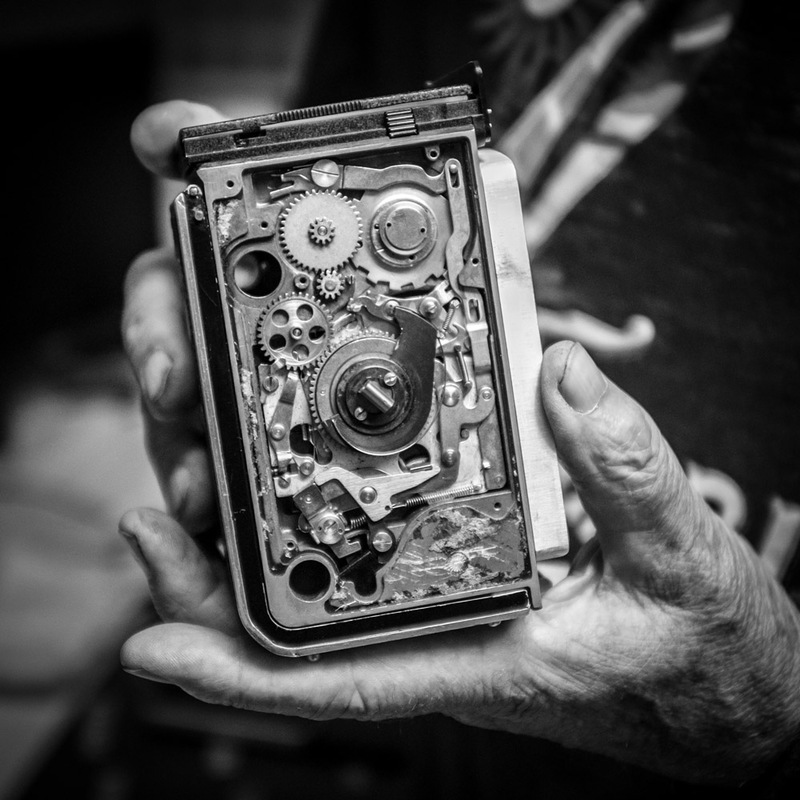 Horst Wenzel shows me the inner workings of the film advance system on a Rolleiflex camera that's over 50 years old. The inner workings of the Rolleiflex camera are an engineering marvel. No wires or integrated circuits here. Just precision mechanics.